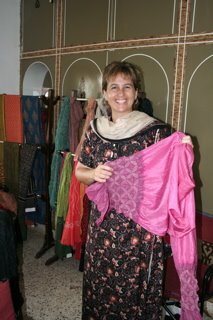 Susanne is inspecting the Bindi Shawls and quality of silk and vegetable dyes. Of course she bought a couple of samples, too. They will come in handy as we need to cover our heads in Afghanistan. She will ultimately be working in Africa, but learning about the quality of silk and dying issues is something she can use everywhere.